Ascolta "Paying for the hotel with your stock footage sales" su Spreaker. but for the goal of working less and to have more time to spend with my family and for studying. What does a microstock producer when something like this happens? turned a weekend of relaxation into a weekend of relax with half an hour dedicated to the creation of stock footage. I had to be very quick while shooting because that was a holiday for me and my girlfriend. Pond5 earnings generated by the stock footage I created that day. I also sold it on Shutterstock and Videoblocks/Storyblocks. Have you ever been in a hotel? Have you ever created microstock when you were there? Ok, I can hear the answer, and you've just understood why I make around 3 thousand dollars per month with my stock footage collection and 99% of you don't make more than 50 dollars. There's a reason why someone makes money in a market with such a great competition as microstock, and that reason is never luck. No results even though working hard. Then you publish it, and the next day you check statistics and it looks like 5 people watched it, while you were expecting 5 thousand. That is a bad moment because it's the moment when you want to give up, but if you hold on and keep working hard, one day you'll see that people will start to appreciate your work. And that's what is happening to my podcast. I'm still unhappy for the few comments I have on iTunes. iTunes comments and reviews are very important for a podcast to find new listeners, so guys don't disappoint me, please. It took me more than one day to produce this episode and I'm going to give you a lot of new suggestions to make more money, and it takes only 5 minutes for you to write a comment. So ban the chatters now I have to answer your questions. How long does it take to sell the stock footage I uploaded? I’ve produced microstock for a couple years, almost stock footage only, on Videoblocks, Shutterstock, and Pond5 as you suggest. Last year I had around 600 clips uploaded (300 of which were bad). They earned me around 300 dollars a month. Last summer I started collaborating with a drone operator and now my portfolio is made of 700 clips, but the earnings didn't raise. I've talked about this with another stock footage producer and he told me that I have to wait 8 to 12 months for the first sales. Do you agree with him? Yes, I agree, and I'm sorry for you. On Pond5 it's rare to sell something before 3 months have passed since you uploaded the footage. Last week I sold some files that I created in 2009 with a mini-DV camera and I never sold before. Agencies' search engines don't have an algorithm with public parameters, so it's hard to tell you in a few words what to do to go up on the ranking. I made a couple of lessons of my course about that. How long does Pond5 take to review my content? I sent some stock footage and stock images to Pond5: is it possible that they take more than a month to approve them? Pond5 today takes around a single day to approve content. Maybe they have a longer waiting list for the newbies like I think you are. Storyblocks is also very slow, thanks to the 100% commission they give to contributors. This information about the review time was given to me by other contributors. If you're wondering why I stopped uploading, let's say this podcast is one of the reasons why, along with my YouTube videos, posts and the course. Maybe it's time to upload again. I don't know. Is it worth to shoot cities in 4k? I think is time to shoot European Capitals in 4k, as you did in Full HD starting from 10 years ago. I think agencies are favouring 4k footage in their searches. Unfortunately, uploading that kind of file is a problem for those who have a slow internet connection, but I think this is the best thing to do right now. Do you agree with me? Yes, I agree. At least talking about travelling, because I visited Europe thanks to stock footage sales (as I explain in another episode of my podcast). But today you won't make as much money as I did, because of competition. You can fix the connection problem you have with Multicloud, which is a free tool that allows you to upload your files and then forward them to multiple agencies using your cloud service connection. 4k is a new technology, but not as new as Full HD was 10 years ago. The magic moment for stock footage producers like me was in 2010, when Canon Eos 550d/Rebel T2i was released and buyers were demanding a lot of Full HD footage. One year later, competition arrived and sales decreased. But for a whole year I had a great time touring Europe. Is making time-lapses with speeded up real time footage a good choice? Is making time-lapses with a video camera a good choice? I would like to avoid breaking the shutter of my reflex with all the images I need to create a sequence. you can't stabilize the video without losing quality (even if you use a tripod, you'll need to stabilize your time-lapse). You have to export at your video resolution, which I think isn't 4k. By creating a photo sequence, instead you can export in any video format, even higher resolution than 4k. You can't compose the framing while editing. When you're shooting outdoors, there are many things that can happen that won't let you capture exactly what you wanted. If you have a photo sequence you can correct your framing on your editing software. If you have a video, you can’t. You're right about the shutter: It breaks! To make money you have to spend money! In my last travel to Paris and London I took around 20 thousand photos that became 100 time-lapses, but I'm a professional microstock producer who wants to make thousands of dollars with a trip like that, and I'm not afraid of changing my camera if it breaks because I used it. I spent around 1000 euros for hotels and train and flight tickets. I spent one week to plan the journey, because to sell more I need to shoot my subjects with the sun behind me: I used a sun tracker. I had to plan to be in a specific place at a specific hour, and to do this I had to spend days to create that plan. Then after shooting, it took me two weeks to keyword the footage. To go on producing content as a professional video maker I have to earn at least 5 thousand euros from that trip. Do you want to live with your parents until you're 50 years old or do you want to have a real life? Because in the first case, I'm not the right person for you. Stop listening to this podcast and reading my blog, because you can have more fun on Facebook sharing pictures of the lunch your mom prepared for you. Sometimes I read posts on a Facebook group about microstock. There are 50 years old men who make 600 euros every month, and think that theirs is a job. I'm a newbie. I don't know anything about videos, can you suggest me a professional camera that costs a maximum of 100 euros. How can I explain to people like this that if you run a business, you have to earn 100 euros in an hour? In London and Paris, I worked with a Canon 550d that cost 400 euros. I didn't work with a Full Frame camera, not because I didn't have the money to buy it (to understand more, please listen to this episode of my podcast), but because I needed lightweight equipment. I’m selling a Canon Eos 550d with 80 thousand shots. Starting price 1 euro. If you don't realize that to make money you have to spend money, please keep on eating your mom's lunch. It's perfect to have so many likes on Facebook. In my website, podcast and course, instead I talk about real business. Why should I buy images and footage if I can steal them? why would people buy images or videos on the web when there's thousands available for free? Dear friend. I think that an answer like: Because it's illegal to download and use content without the author’s authorization. isn't the answer you want. To give you another kind of answer, I have to say that images and footage are 2 different things, talking about what you can find with Google, and illegally download. High quality videos that you can find without the watermark aren't many. I'm an editor, and sometimes I edit videos by using stock footage created by others: If I have to steal videos from Youtube, sometimes it will take days to find a good one. So, since it's a business for me, I prefer paying for the content and downloading it from a microstock agency. that I talked about in the previous episode. Second, because Google images indexes a lot of good shots, and writing the disclosure this image may be copyrighted is not enough to prevent illegal use. When images are published for business, like for websites and advertising, usually a buyer prefers to pay 10 euros and know he won't have any copyright issues. Pexels and Unsplash today have good collections, but not as good as Shutterstock's. Let's say Shutterstock is like my course. It sounds like a strange sentence, but I'm gonna tell you what I mean. In 2013 I lost my job, so I tried to become an independent TV producer, after being a story editor for a TV show. I tried to produce my own show. 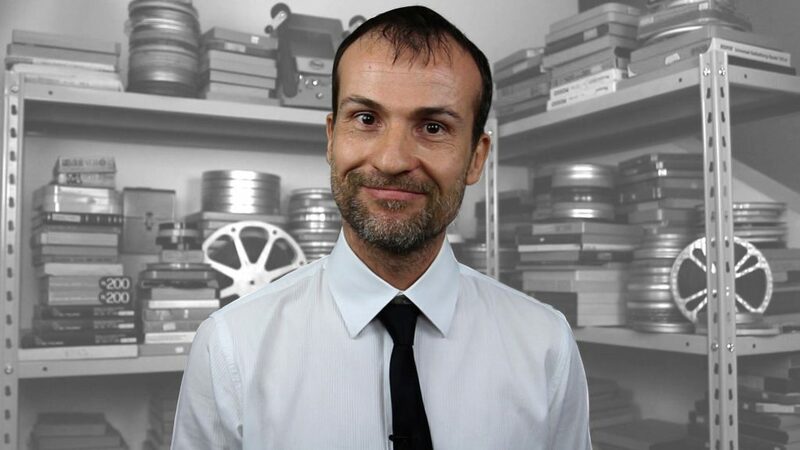 I was sure I could do a great job, and I had some talk with acquisition managers of Italian channels and one day I went crazy, and started producing my show without the OK of a channel. I lost a lot of money because nobody finally bought my show. Let's create a course. You make the videos and I make the website to sell it. Do you want to know my answer? Why would people buy it, if there are thousands of free tutorials you can find online? because there's no other online courses about microstock in the whole world. because the free content you can find on YouTube is usually made by people that earn 50 euros a month. If these people earn only 50 euros a month, how can they teach me how to make money? I publish all the statistics that certify that I had great improvement since I started being a microstock producer full time, and today I make 3,000 dollars a month selling my photos and videos online, even without producing new content in the last 6 months. in my website there are more than 100 free contents that took me months to create: posts, videos, and episodes of this podcast, so you have all you need to trust me. It can't be a scam. I'm sure that you won't find anything else for free like this on the web. You can try to find it and spend weeks to save 297 dollars, like the director who spends days to download illegal footage from Youtube, because he doesn't want to give 79$ to Shutterstock to download an HD clip. Maybe after downloading the footage from YouTube he understands that the footage is rubbish. I believe that what I say in my course can help people making a lot more money, maybe going from 20 dollars per month to 200. It depends on how hard they work and how good they are. But you have to choose your way my friend. For which reasons should I buy your course? I simply reply that I don't have to convince anyone, because people can find everything they need on my blog. I'm not like those gurus that talk like a used cars salesman. If someone listens to me and doesn't believe me, he's a fool because he's wasting his time. If instead he believes in what I'm saying, I think the 297 dollars he pays for my course will double his earnings within a few months, and he will probably make 10 times that figure thanks to my course. I don't really understand why people listen to me but don't buy the best part of my teaching. I teach how to make money, not how to take pictures for a hobby. How to shoot travel photos and videos. I wouldn't book the flight one month in advance to have the best price. I wouldn't shoot without a plan. I wouldn't upload my content to all the agencies, just because it's free. I wouldn't waste too much time keywording, since I know how to transfer descriptions and titles in 5 minutes using a .csv file. Good: you just wasted hundreds of euros of royalties, but you have saved 297 dollars for my course. before leaving I would spend a few days at home to create a plan by tracking the sun’s position to have always the perfect light on my subject. I would invest part of my budget on booking a flight two days before leaving, so I will be sure that the weather will be sunny. I would reserve a hotel in the city centre. I would stay only 3 days in the city, saving money and time to edit the footage. I would send my content just to three Agencies. In other words: I would spend the same amount of money. I would work less, and I would earn 10 times more than a producer who improvises. Pond5 earnings generated by the stock footage I created at Parc Guell in Barcelona. Shutterstock earnings generated by the stock footage I created at Parc Guell in Barcelona. These are my 2 best sellers only. 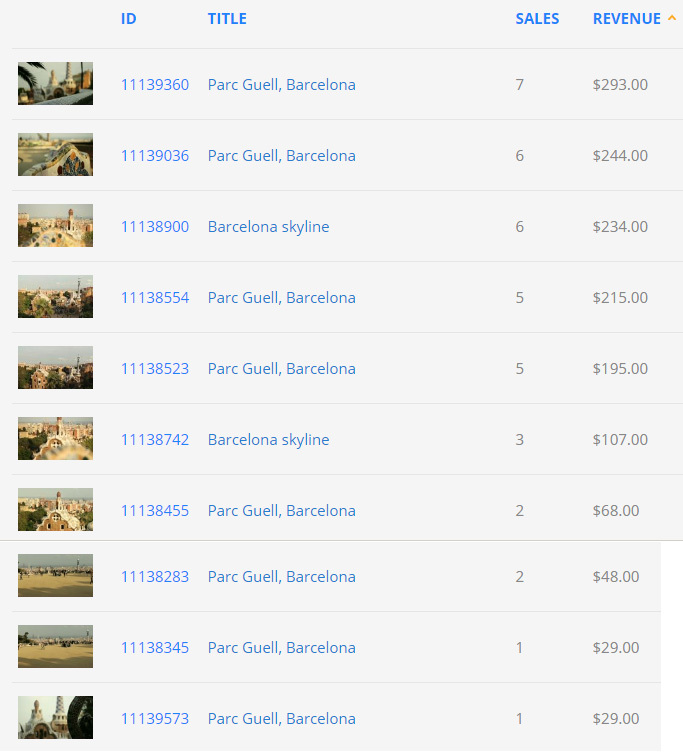 Please look at the screenshot of my sales report of the stock footage I've created at Parc Guell in Barcelona in a couple of hours. This is real money, not marketing. Let me tell you: welcome to the world of a professional microstock producer.